This story was originally published Sept. 24, 2015, on FIU News. FIU has implemented new teaching methods resulting in double-digit pass rate increases across introductory math courses. Throughout higher education, math courses have some of the highest failure rates nationwide. Even though math is a skill nearly every person uses on a daily basis, it has become a significant impediment to degree completion. FIU is not immune to this reality. It is what led to the creation of the Math Mastery program in 2010 — a high-tech, high-touch approach to improving student performance in College Algebra. 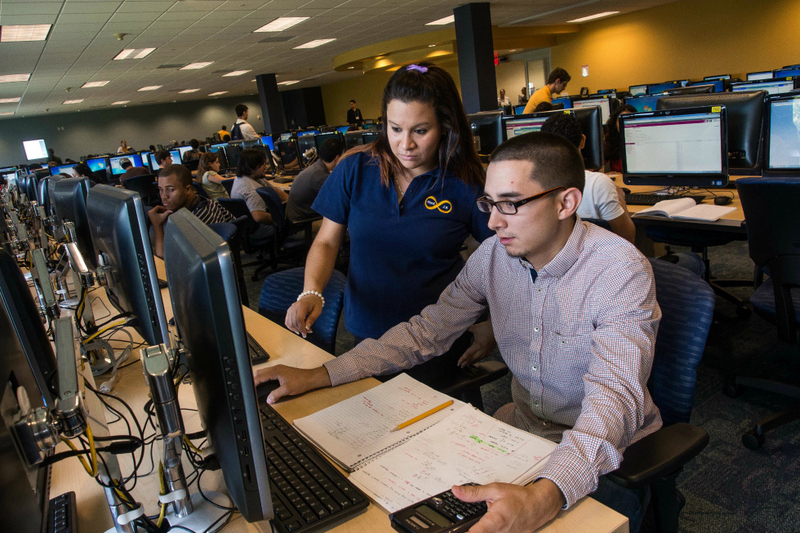 FIU’s Math Mastery Program, which utilizes evidence-based teaching techniques including peer mentoring and a state-of-the-art computer lab, has since led to other projects that are reversing course on this trend. With the implementation of new approaches to teaching this past academic year, nearly 900 students who were at-risk of failing were able to successfully complete their lower division math courses. This is in addition to more than 1,300 students who successfully completed College Algebra — but would have likely failed using previous teaching methods — since the inception of the Math Mastery program. The transformation included onsite and online versions of Precalculus Algebra, Trigonometry, Finite Math and Social Choice Math. Prior to this intervention, the combined average pass rate in those four courses was just 37 percent. During the 2014-2015 academic year, pass rates increased to 52 percent while the rigor of the curriculum remained intact. At this lab, students receive help in a subject key to success in college: math. Faculty engagement was a key component. A team approach was devised, allowing for cross-collaborations on common issues and challenges. Special workshops were offered to arm the professors with new, evidence-based teaching methods. In addition to new teaching methods and peer learning, technology is also playing a role. High-tech components include personal response devices, such as iClickers, which provide real-time feedback for students and instructors. But ultimately, the success is tied to the relationships between students and the course content. In addition, an important component to the changes being implemented in FIU’s math classes is the use of Learning Assistants. The Learning Assistant (LA) program was pioneered in Physics as a teacher preparation program during a time when enrollment numbers were steadily dropping for physics majors. Today, the peer-mentoring program is being implemented at a much greater scale. In addition to physics and math, FIU has deployed LAs in chemistry, earth sciences and biological sciences. FIU currently has the largest LA program in the country, with 178 Learning Assistants supporting more than 6,700 enrollments in 110 sections of STEM courses in nine disciplines. Additional lower division courses that will undergo instructional transformation at FIU include Introduction to Statistics for Behavioral Science I and II, and Geometry for Educators — all are important gateway courses critical to improving student success.